As an owner of Corporate Caterers franchise, you will become part of "the best segment" in the food industry. Our in-house corporate staff has over 80 years of expert catering, restaurant and food purchasing experience. This franchise offers a tested complete packaged system; including menus, recipes, marketing tools, on the job training, operational guides and our informative Corporate Caterers staff for assistance year round plus ten days of full onsite support at your location. We have been operating and perfecting the Corporate Caterers brand and system for more than a decade. We learned to do something no one else was doing, because we wanted to change the face of traditional office catering. We enjoyed testing the waters, customizing our system to the needs of the corporate client and creating a unique new Franchise, Corporate Caterers. Now we can share our exclusive information that combines an easy system, top-notch presentation and enjoyable lifestyle, with other customer focused business owners. And with all that corporate support, we are still small enough to adjust to the needs in your marketplace, while supporting each new owner in our system with single-minded enthusiasm and energy. We'd like to share our story, our vision and our passion with you and let you draw your own conclusions. Then, when you're ready to talk further, we'll meet and discuss the possibilities of you owning a Corporate Caterers franchise. We're looking for enthusiastic, energetic franchise owners who can recognize that this opportunity is knocking. We're ready when you are! If you are interested in taking a closer look at a Corporate Caterers franchise, please take a few minutes to fill-in the information below, and we'll be in contact with you soon. "Catering is one of the star performing segments in the food service industry," -Hudson Riehle, Senior VP, National Restaurant Assn., quoted by Ann Meyer, in the Chicago Tribune, May 9, 2005 It starts in the kitchen with great food. We prepare food that keeps our costumers returning time and again. We'll teach you and your staff our techniques: prep work, cooking, ordering from vendors, marketing to clients, processing paperwork and billing. We have developed the systems and procedures to help streamline your workflow and manage your business efficiently. Here at Corporate Caterers it really is all about the food and service. Whether it's breakfast or lunch, we've developed menus that sell and satisfy. We maintain a core menu of proven popular entrees and side dishes, plus we'll work with you to customize a portion of the menu to fit the regional tastes in your market. We enjoy a scalable business, which is very rare in the food industry. We add staff based on catering demands and business growth. We adjust our food and labor costs the same way. Because we cater a fixed number of meals each day, we can minimize wasted food and labor costs. We also cross-train key employees and educate team members to understand and support the whole process so they can help in many areas as needed. Clients appreciate our professionalism, value our services and are pleased with our pricing—order after order. And clients' repeat orders confirm the value of our philosophy. That's your Corporate Caterers advantage, too. The time is right! We offer you multiple advantages over many restaurant concepts and other retail food establishments. Our Franchise focuses on a growing demand for Delivery Only Catering that is literally booming across the country. What are the Corporate Caterers advantages? We are eager to tell you our story, share our enthusiasm and find out if we are a good business "match" for each other. Simply fill-in the information below and we'll contact you about receiving our full brochure package that includes pictures, our Menu, more about our concept and investment information. 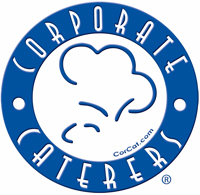 Note: Corporate Caterers is expanding only in the following states: Alabama; Arkansas; Connecticut; Delaware; Florida; Georgia; Kentucky; Louisiana; Maine; Massachusetts; Mississippi; Missouri; New Hampshire; New Jersey; North Carolina; Ohio; Pennsylvania; South Carolina; Tennessee; Texas; Vermont; West Virginia. Corporate Caterers franchise opportunities in Georgia include Augusta, Macon, Savannah, Columbus/Phoenix City and Atlanta. In Florida they include Pensacola, Tallahassee, Jacksonville, Sarasota/Bradenton, Ft. Myers/Port Charlotte, Titusville/Melbourne, Lakeland/Winter Haven. Click on Request Information button above for FREE information on how to start a Corporate Caterers franchise today! Please Note: Corporate Caterers franchises for sale, and other franchise opportunities, business opportunities, businesses and franchises for sale on this web site are not to be considered as an "offering", "franchise offering", suggestion or recommendation by GlobalBX. The franchises, businesses and business brokers seen on this web site submit their own individual content. This advertisement depends entirely on the truthfulness of the information provided by our advertisers which includes, but is not limited to, franchisers, franchises, franchise brokers, franchise consultants, business sellers and business brokers. As always, GlobalBX recommends that you consult a lawyer, financial consultant, accountant or professional advisor before buying a franchise or business opportunity or any type of business. By submitting this form and requesting more information, you have agreed to all terms and policies of GlobalBX and the business and franchise offerings listed here. Please review our Terms & Conditions for more information.